You might already know that despite women making up 47% of the US workforce, they account for only 20% of C-suite roles. What’s surprising is that just 66% of companies in corporate America have a gender diversity strategy to try to change this. That’s just one of the insights revealed in the Women in the Workplace 2017 report, a recent study conducted by Sheryl Sandberg’s nonprofit organization LeanIn.org in partnership with McKinsey & Company. The study explores data collected from 222 companies and more than 70,000 employees. While the overall picture it paints of gender diversity is a familiar one, some of the insights are very revealing. Here are 11 of the most important stats from the report that recruiters and HR professionals should know. The report found that while many companies are taking steps to promote gender diversity in hiring, some are lagging behind. Just 66% of companies surveyed have a strategy in place to increase hiring for underrepresented groups. Some strategies are getting more traction that others: 25% have set targets for gender representation in their hiring process. But more than a third (36%) of companies aren’t checking their job descriptions for biased language, and 28% don’t use clear and consistent evaluation criteria for every candidate. And, only 6% remove names from resumes before they’re evaluated. The data shows that up to 77% of companies offer at least one policy that supports women in the workplace, with a flexible schedule being the most common. While 63% of companies offer maternity leave longer than that required by law, fewer than one in five support child care with subsidies or on-site facilities. Since 57% of working women surveyed have partners who also work, these programs help women achieve a better work/life balance. Most (but not all) companies hold themselves accountable in some capacity when it comes to gender diversity. 70% track representation of external hires, and 85% track representation by level. But the number that set targets for gender representation is significantly lower, with 25% setting targets for external hiring. Women make up more than half the planet’s population. But you wouldn’t know that looking at the average C-Suite. In fact, only 20% of C-suite roles are held by women—meaning only one out of every five executives is female. That’s not to say things aren’t improving. For one thing, the number of female CEOs helming S&P 500 companies hit an all time high in 2016, a 22% increase over the previous year. But that still amounted to just 27 out of 500. 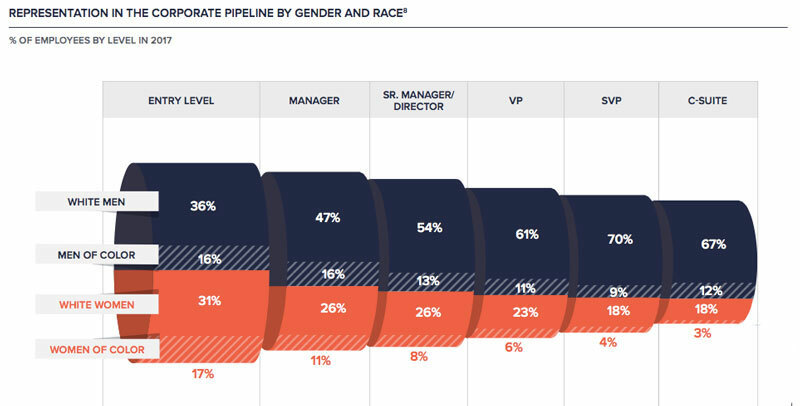 Women of color have even less C-suite representation. Despite accounting for 19% of the US population, they fill just 3% of C-suite seats. It’s not just the C-suite that has a diversity shortage. The percentage of roles held by women steadily decreases at every seniority level along the career path. At entry level, representation is almost equal, with 52% of positions held by men and 48% by women. But by the managerial level, the number of women drops by 11%, and the decline continues from there. Between entry level and the C-suite, the percentage of female employees more than halves—while male representation increases by 27%. The trend of decreasing female representation across seniority levels is consistent across every industry. 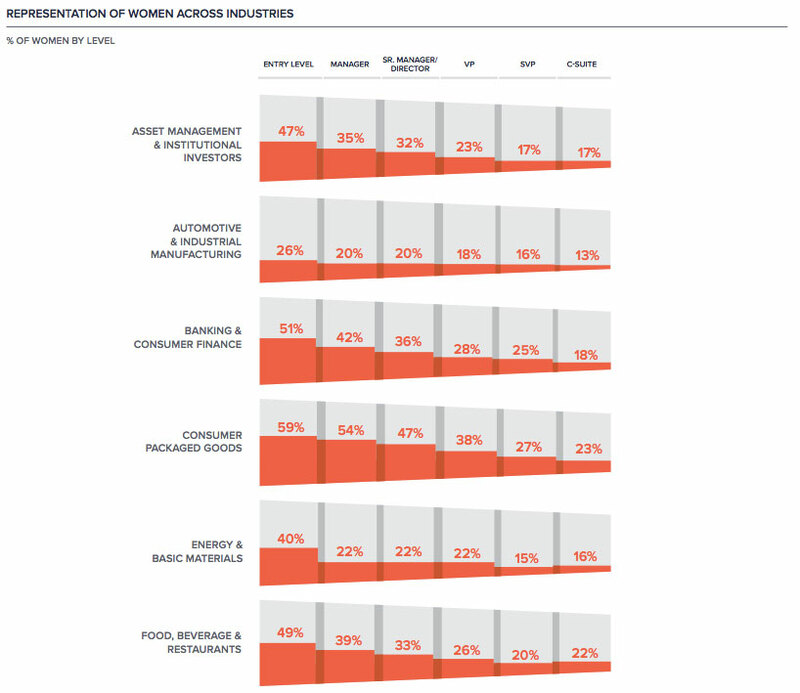 Even industries that are female dominated in the early stages of the career path see a steady drop-off of female representation toward the C-suite. Take health care—73% of entry level positions are held by women, but just 35% of C-suite executives are female. The biggest disparity exists in the insurance industry. Despite women making up 57% of entry level employees, only 17% of C-Suite roles are held by women. 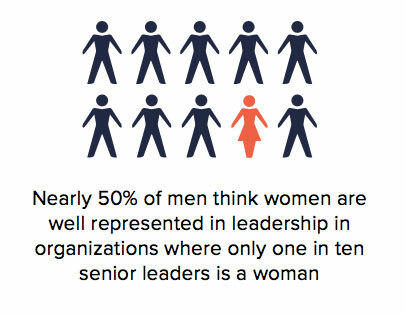 Almost half of men think women are well represented in leadership in organizations where only 10% of senior leaders are women. In addition, More than 60% of men say that their company is doing what it takes to improve gender diversity, while only 49% of women agree. These numbers show that some men might not fully realize that a problem exists. Plus, some feel that diversity efforts disadvantage them: 15% of men think their gender will make it harder for them to advance, and white men are almost 50% more likely than men of color to think this. Only 2% of women who plan to leave say they’d do so to focus on family, with 1% of men saying the same. This data helps debunk the common misconception that women don’t advance at the same rate as men because they want to start a family. In fact, the figures shows that men and women plan to leave their current company at nearly identical rates—and men are only fractionally more likely to remain in the workforce. Among millennials, men are doing more household work than ever, with 18% saying they do most or all of it compared to 10% of men over 30. Despite this, women are still overwhelmingly picking up the slack at home, with 38% of women under 30 saying they do most or all the housework, and 40% of women over 30 saying the same. Pulling double-duty at work and in the home can make it harder for women to advance. Women’s attrition rates are highest among women of color, and especially among black women. The attrition rate of black women is 18.2%, compared to 15.4% for white women. 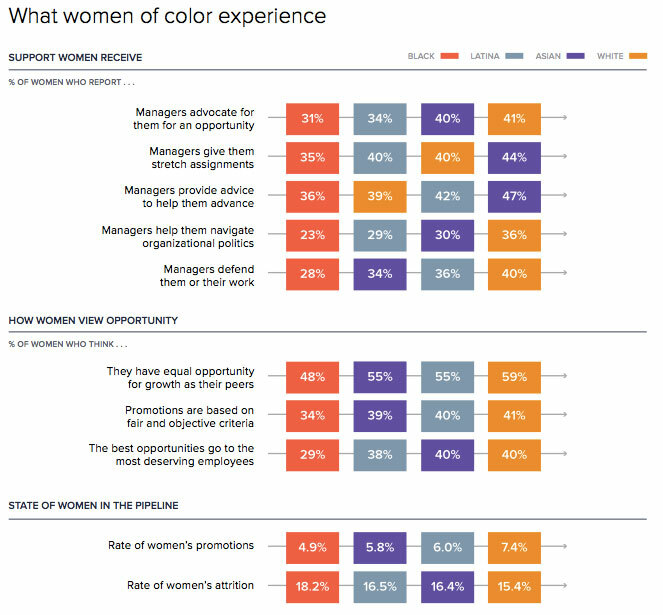 One reason for this could be that only a third of black women report they receive advice or advocacy from managers (31% and 36%, respectively). Overall, only 48% of black women feel they have equal opportunities in the workplace as their peers, while 29% feel that the most deserving people get the best opportunities. While 90% of companies reported that gender diversity is a priority, only 52% of employees agreed that the company prioritizes it. 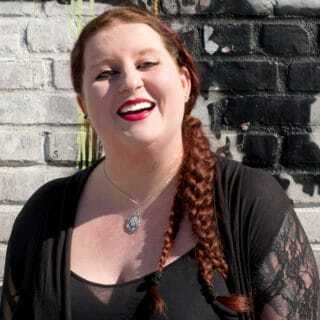 Employees were also more likely to think that the company focuses on gender diversity because it looks good, with 52% reporting this compared to 23% of companies. 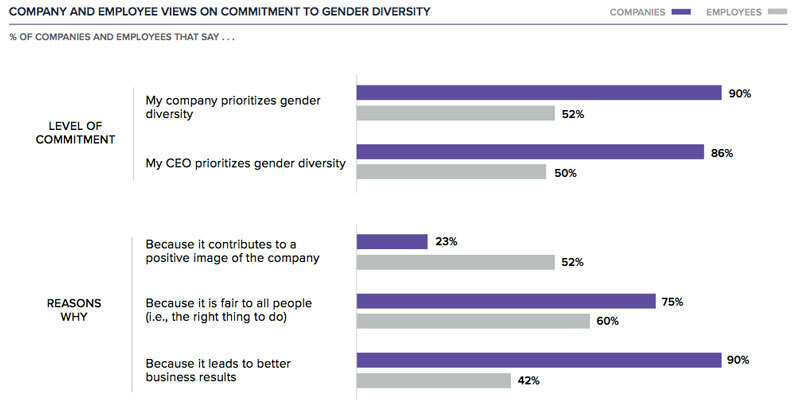 And while 90% of companies agreed that gender diversity is good for business results, less than half (42%) of employees felt this was a reason for their company’s commitment to it. While many companies are tracking their diversity figures and taking steps to improve female representation, there’s still a long way to go. Utilizing artificial intelligence (AI) in the screening process can help. With even a few tweaks, the figures in next year’s report might be rosier.